Coach George came to Queen City in 2013, initially leading a team that included current QC coach Ravshan Temirov. Since then, George has stepped into the position of QC Girls Program Director while working with both boys and girls QC teams. George’s Queen City teams have won multiple VSL League and Tournament Championships. Coach George has several years of collegiate and high school coaching experience. Most recently, in 2018, Coach George took the helm as Head Men's Coach and Director of Soccer at his alma mater, Green Mountain College, after spending a year there as the assistant women's coach. In his single season leading the men's team before Green Mountain's closure, George led the team in an incredible turnaround as the team earned the program's highest win total since the early 2000s, ultimately losing in the NAIA AII Conference Championship. As Director of Soccer, George laid the groundwork for the GMC Women's team radical two-year turnaround as well, recruiting many of the talented players on their 2018 NAIA AII Conference Championship Team. From 2006-2007, Coach George was Assistant Men's Coach at King's College in Wilkes-Barre, PA, and was part of their ECAC Championship season in 2007. George was also Head Women's Coach at King's for the 2007 season before moving back to Vermont in 2008. While at King's, George also coached with United Soccer Training Academy, preparing youth players to move into professional clubs in Europe. In addition to Queen City, Coach George has coached with several other club teams in Vermont and other states. While in Pennsylvania, George got his club-coaching career started early, first working with younger teams in 1998 at Northeast Attack SC. 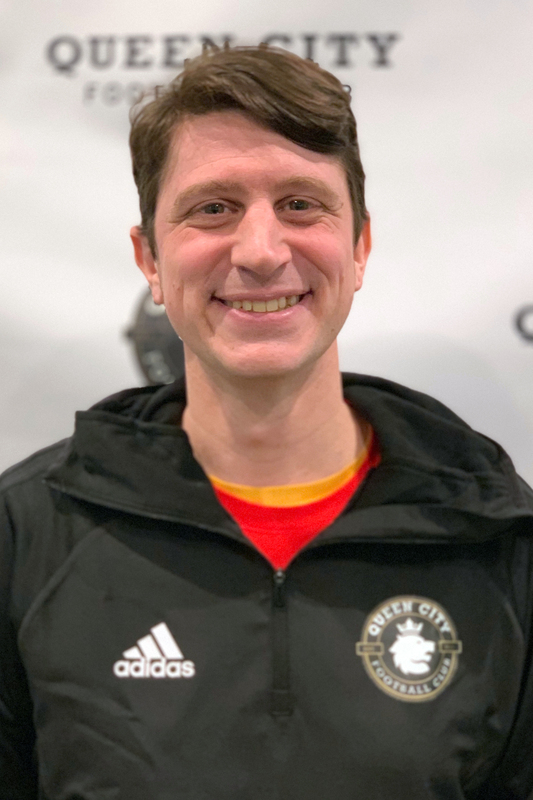 When he moved back to Vermont in 2008, he started coaching at Far Post SC, leading boys and girls teams to multiple VSL League, Tournament, and State Cup Championships. During this time, he was also on the Rice Memorial High School Boys Soccer staff. As a player, George played his collegiate ball at then NCAA DII Green Mountain College, earning Academic All-America Awards in 2003 & 2004 seasons. Growing up in Northeast Pennsylvania, he played with several top-level clubs. At Crestwood High School, George was a league all-star on the program's first League and District Championship teams. Coach George has licensure through the United Soccer Coaches and United States Soccer Federation pathways. George has his USC Advanced National license as well as the USSF D License.